Driving from North to South along the West Coast. You’ll follow the Pacific coastline all the way down through Washington, Oregon and California. Includes flights, hotels, car hire and a fab road trip pack. Arrive in Seattle and check in to your first hotel. If you have energy left after your flight, why not have dinner at one of Seattle’s great restaurants. You could try great seafood down by Pike Place Market, or head over to Bell Town for international dishes. Emerald City is one of the fastest growing cities in North America, famous for its coffee, grunge music and a growing tech sector. It has a laid-back charm with visitor highlights including Pike Place Market, Space Needle and Pioneer Square. Another full day to discover the charms of Seattle. You may want to get a great view of the city and the Puget Sound from Kerry Park which you can reach in a matter of minutes by public transport or taxi. The words rugged, craggy and remote come to mind when thinking of Olympic National Park. Situated in the far northwest of Washington State, this is one of the wettest places you’ll be ever likely to visit. This unique climate makes Olympic National Park a very special and atmospheric place to explore.And you won’t be alone here, wild Roosevelt Elk live amongst the trees, alpine meadows and waterfalls. Rialto Beach is a magical beach with the huge pieces of driftwood, the sea stacks, the black sand beach littered with perfect round stones, and the foam from the Pacific. This is just one of the many amazing destinations, our itinerary pack will show you many more places of outstanding natural beauty in this wild and wonderful region. Time to swap your hiking boots for something a little cooler, you’ll find plenty of trendy shops, cafes and bars on the streets of Portland. If you are thinking of doing some shopping whilst away then Portland is a great place to splash the cash. Why? Varied shopping to suit all tastes and budgets, and there is no Sales Tax to pay in Oregon. Massive sandstone boulders look like they have been dropped from the heavens along this 360 mile stretch of coastline. Rugged, wild and windswept - Oregon’s beauty is up with the best of them. Continue driving down stunning Route 101 and explore nature's artistry at work, driving through forests and coastal areas decorated with mist and fog. A volcano topped with a crystal clear lake - stunning! Crater Lake has inspired people for hundreds of years. No place else on earth combines a deep, pure lake, so blue in colour; sheer surrounding cliffs, almost two thousand feet high; two picturesque islands; and a violent volcanic past. It is a place of immeasurable beauty, and an outstanding outdoor laboratory and classroom. Start your California experience with a visit to the majestic Redwood National Park and some of the State Parks that surround it. The biggest trees on Earth! Redwoods were once common through North America but are sadly now only predominantly found in Oregon and California. For the ultimate Sequoias experience head to the Redwood National Park in northern coastal California. These are true giants at up to 100m high and 11m in diameter. Stand amongst these trees and let the stresses of work and home life just melt away. You don't have to like wine to enjoy this beautiful area. These two neighbouring valleys offer stunning scenery made up of perfectly manicured vineyards stretching across rolling hills which can be enjoyed by car or even by an early morning hot air balloon ride. This is a foodies’ heaven too, with places like Thomas Keller’s Bouchon, and if you happen to like wine then visit one of the hundreds of vineyard tours available in either Sonoma or Napa Valley. Spanning the headlands of San Fran and Marin County, one of the world's most beautiful bridges is a delightful experience whether you walk, bike or drive across. You can also gain stunning views of the bridge and the city beyond by driving up Conzelman Road on the north side of the bridge. Once you hit town, you’ll be able to explore the city's iconic places. Monterey was once California’s capital, however, today it's best known for the world-class Monterey Bay Aquarium that resides on Cannery Row. In years gone by this town was famous for its whaling and sardine industry, it now focuses on marine education and preservation. Want to experience the bay area first hand? Take a whale watching trip during spring or autumn. Connecting Monterey and Carmel-by-the-sea, 17-Mile-Drive is a scenic toll road which takes you on a little tour past rugged beaches, millionaire homes and wind-blown cypress trees. Seals bask in the sun on offshore rocks and sea otters bob up and down in the waves. Point Lobos marks the start or end of the Big Sur. However, such is the beauty of this State Reserve that it demands to be visited whilst in the area. Seal lions give birth to pups on the inaccessible beaches, sea otters frolic in the bays and whales slowly migrate through the 750 acres of the park that are under water. Pure beauty that can be enjoyed through the many short walks. After Point Lobos, why not stop for lunch in beautiful Carmel and then do some window shopping. Carmel also boasts two world-class beaches, so finish the day watching the sunset over the Pacific. Big Sur is arguably the best driving experience in all America. Enjoy the winding roads, State Parks and stunning vistas. Along the way, Hearst Castle perches on “The Enchanted Hill” and overlooks the Pacific Ocean in the distance. Hearst Castle is truly the product of one man's ambition, wealth and imagination. Santa Barbara is an ideal stop off for anyone touring the Pacific Coast Highway between San Francisco and Los Angeles. This is an affluent town, built in a charming Mediterranean style - making it one of the Central coast's best highlights. Hollywood is synonymous with glitz and glamour, and although many of the studios have now moved on to other parts of town it's still fun to visit the home of the Oscars and walk Hollywood Boulevard looking for the handprints of your favourite movie stars. Just a short drive northeast of here lies the Griffith Observatory, perched high on a hill overlooking the urban sprawl of LA, this recently renovated landmark is well worth a visit. The pier brings Route 66 to a glorious end, and Santa Monica with its “Baywatch” beaches and old-fashioned pier is a worthy finishing point for any road trip. Hire a bike and cruise the boardwalk down to Venice Beach or shop your heart out at the 3rd Street Promenade. Or maybe you’ll prefer to just watch some of La La lands characters play basketball or push weights, while you enjoy a morning coffee at one of the many cafes. If you have an extra few days to spend away, then this trip can be extended to visit Newport Beach, Laguna Beach and San Diego. If you have four weeks to travel then Palm Springs and Las Vegas can be added also. Driving in North America is a pleasure. The roads are often wide, empty and scenic. Combine this with an automatic transmission car designed to cruise the roads of this continent, and you'll easily eat up the miles as you tour around on your flydrive road trip holiday. 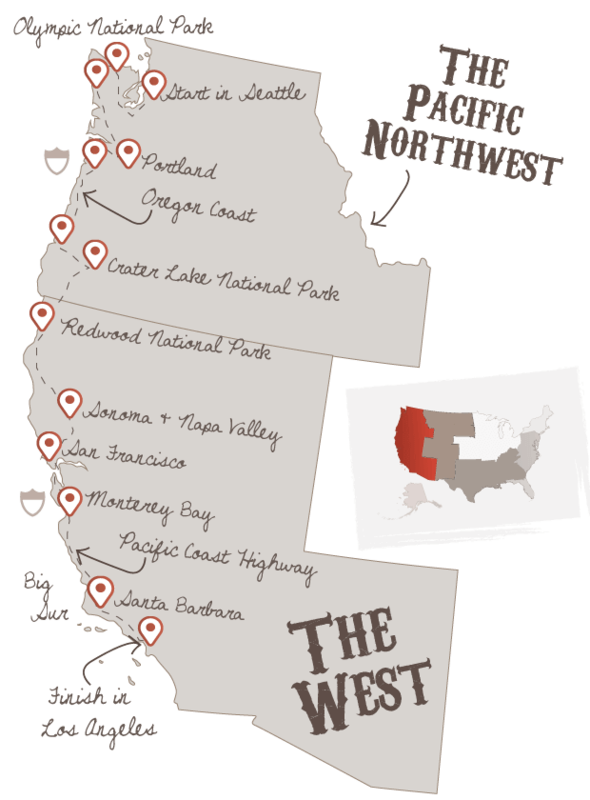 Don't forget to check out this road trip's Itinerary tab to see more amazing pictures from our "Ultimate West Coast" tour. You'll also be able to read a little bit about what you'll be getting up to on each day of this incredible road trip adventure.